In this card I used an embossing folder with ornaments on green cardstock. They are pretty, but by themselves they don’t really pop. Being a dark card, stamping on it would have had little effect unless it was heat embossed, and I can have real trouble stamping straight potentially wasting the card panel … (I have been looking at a Misti or similar but I have a lot of wood mounted stamps and you can only use it with thin stamps). I got around this by stamping some scrap white cardstock in co-ordinating green ink, punched the edges with a scallop punch (it’s not even on the ends but it still works in an odd sort of way!) and then mounting that on glitter cardstock in a similar green tone to the cardstock. It looked better, but still not quite there, so I added some glue to some of the dips in the ornaments and threw some green glitter over it. The final product is a bit glittery but not too much and still lets the raised embossing be the main decoration on the card. For this card, the raised emossed “Merry Christmas” is front and centre – my biggest hurdle was how to get it to pop but co-ordinate? 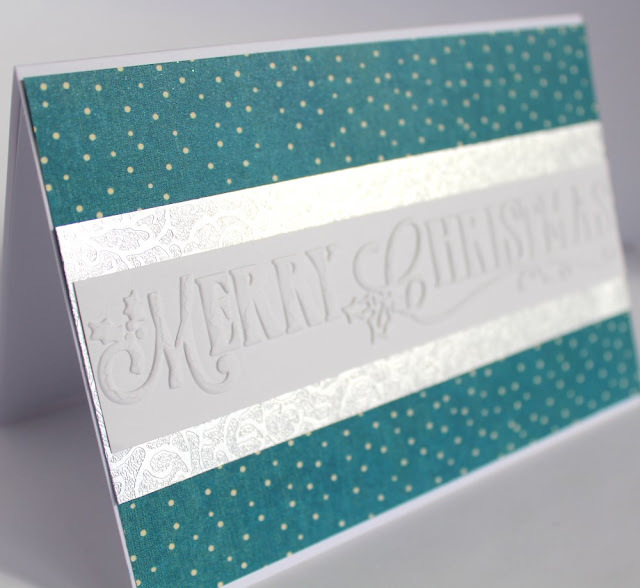 The answer was to mount it on a white card base, top with some teal spotted patterned paper (which could look a bit like a snowy night) and then a strip of embossed foil paper to border the Merry Christmas sentiment. Quick and easy and super effective! 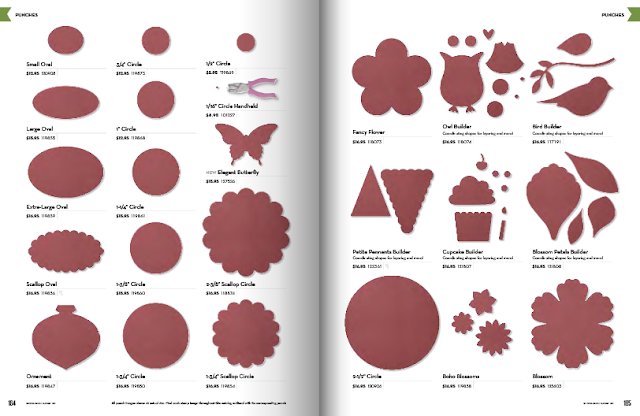 A 5x7” embossing folder is great but what do you do when all your card bases are 6x4? Well, in this case I cut the embossed sheet in half! On white card bases, I mounted one with silver embossed paper and one half of the embossed white card and the other was with a green Christmas paper and the other half. They looked good but needed a little more – I’m not in the habit of putting pre-made die cuts on, but these matched so well and added just enough “pop”! This embossed panel was of a single ornament. It’s quite lovely and large and so I kept it as the focal point, mounting it on pink cardstock (who says Christmas has to be just red or green!?) 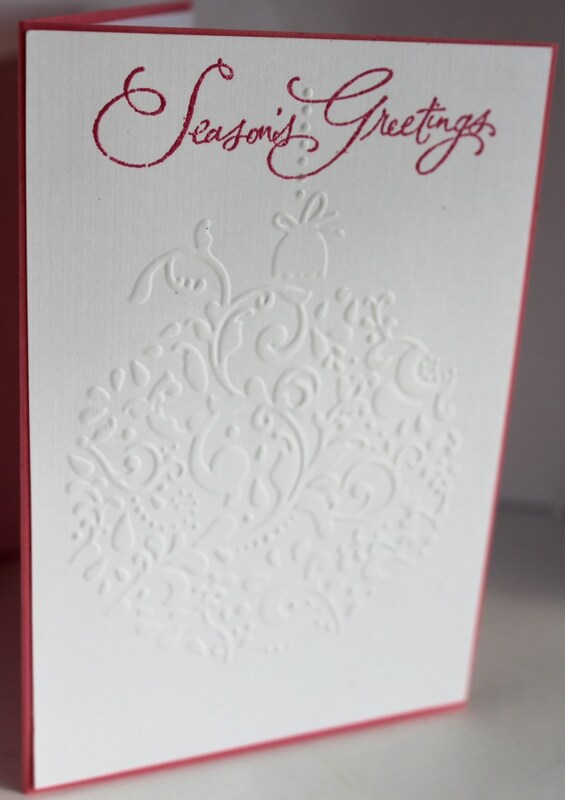 and then added a Season’s Greeting to the top of the ornament in versamark, heat embossed with pink embossing powder. It looks very effective! 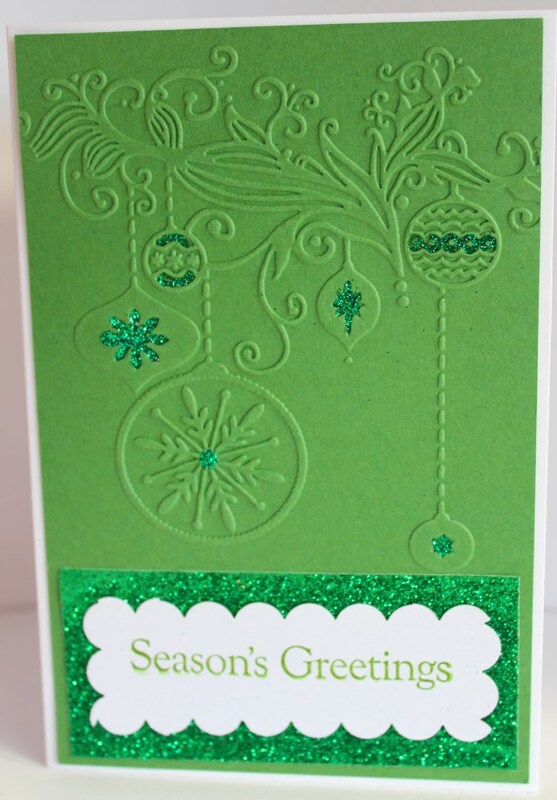 Last but not least, this is the same embossing folder as the first card that was in green. Doesn't it look fab in white? I took a big deep breath before stamping and heat embossing the sentiment in silver. To add just a wee bit more interest I added some glitter to 2 of the decorations and rhinestones to the centre of some of the decorations. So easy, quick and I certainly wouldn't mind receiving it! All these cards took about 10 minutes to make including deciding what to do, so I hope they spur you on to creating your own raised embossing Christmas cards!